Lenovo today took the wraps off the Moto E3 Power, launching it in India at a price of Rs.7,999. The latest Moto E smartphone is another entry level model from Lenovo, but this phone focuses on battery life as well. With a big 3500 mAh battery, the Moto E3 Power should last you more than a day easily. Launched at an event in New Delhi, the Moto E3 Power comes with some good specs for an entry level smartphone. It features a 5 inch full HD display, runs on Android 6.0.1 Marshmallow out of the box and comes with a big 3500 mAh battery. 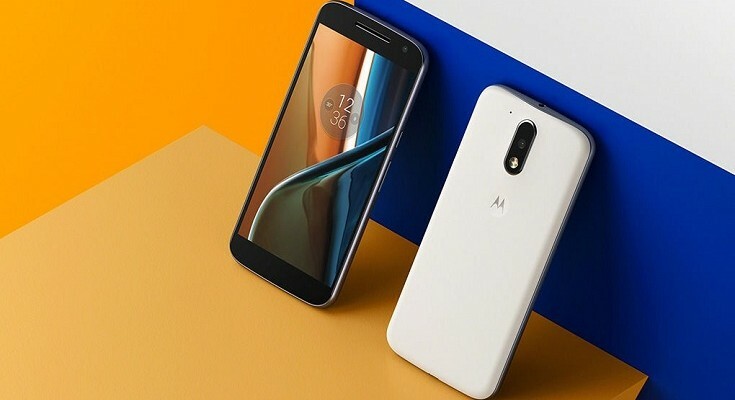 It is also the second Motorola smartphone in the Moto series to come with a Mediatek processor – the first being the Moto E3. The Moto E3 Power comes with a quad core 1 GHz Mediatek MT6735P processor and Mali-T720MP2 GPU. There is 2 GB RAM and 16 GB internal storage, with an option provided to expand it up to 128 GB using a microSD card. The phone also comes with dual SIM support, including LTE support in one SIM. The SIM card slots support micro SIM in both the slots. Coming to the imaging department, you get an 8 MP camera on the back that is assisted by an LED flash. On the front, you get a 5 MP snapper. Given that this is an entry level smartphone, the camera specs seem adequate enough. Connectivity options include Wi-Fi b/g/n, Bluetooth 4.0, GPS, aGPS and FM Radio. The 3500 mAh battery is non user-removable. 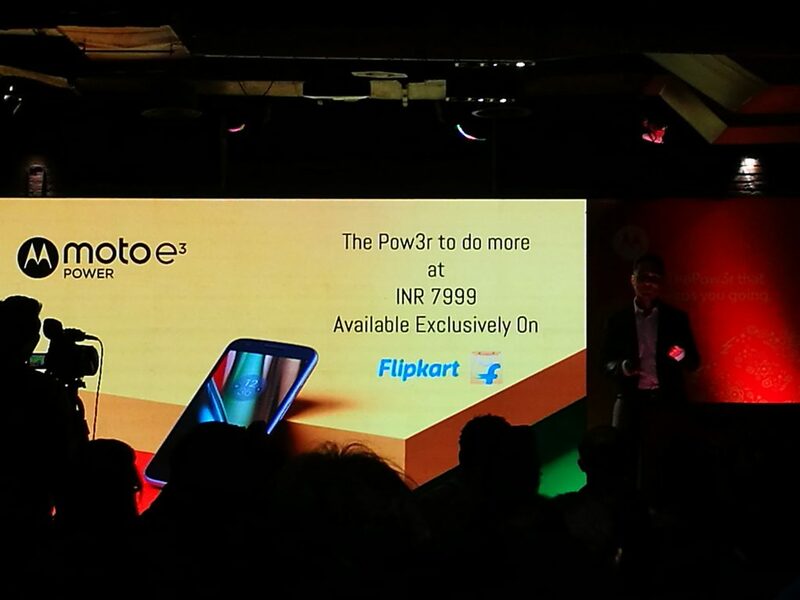 The Moto E3 Power will be available exclusively on Flipkart. Lenovo has priced it at Rs. 7,999. 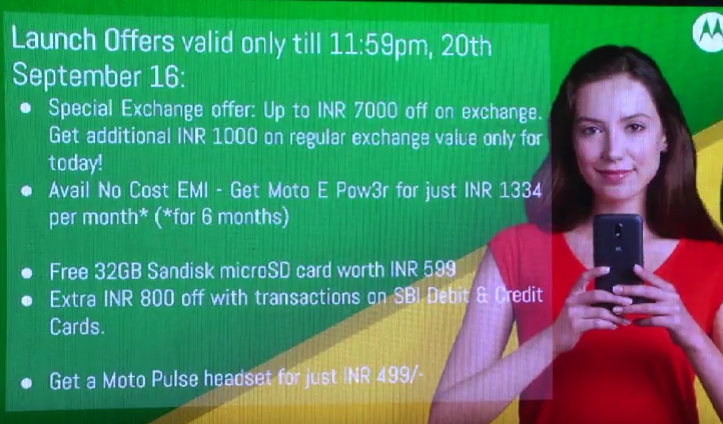 There are some attractive offers if you plan to buy it today, below is the list of offers available for Moto E3 Power.